Gelatinas are a popular dessert throughout Mexico and come in many unique flavors and shapes. Of course, no holiday celebration is complete without one of your tías bringing her fanciest gelatina, right? My favorite kind of are the ones with colorful layers! 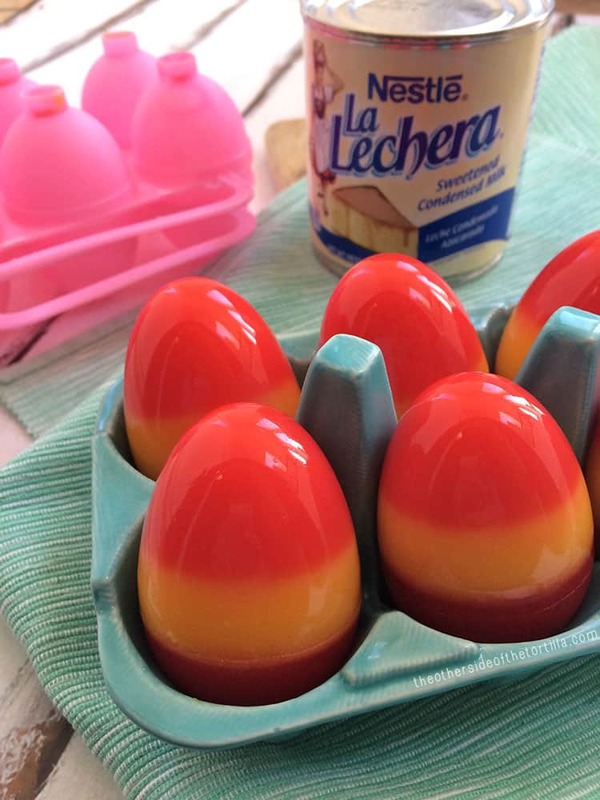 I was making a list of Easter dessert ideas the other day to bring to my aunt’s house for our family’s celebration and I decided to check out ElMejorNido.com for some inspiration. I love that I can save, organize and rate recipes, as well as make shopping lists and get recipes and special offers delivered my inbox every month. I came across some great ideas and recipes for making gelatinas that sparked a memory. When I was a little girl, I remember my mom making a unique gelatin mold for Easter in the shape of Easter eggs with a special mold. The secret to the most vibrant, intensely colored layers is adding sweetened condensed milk, which also makes the gelatin opaque. 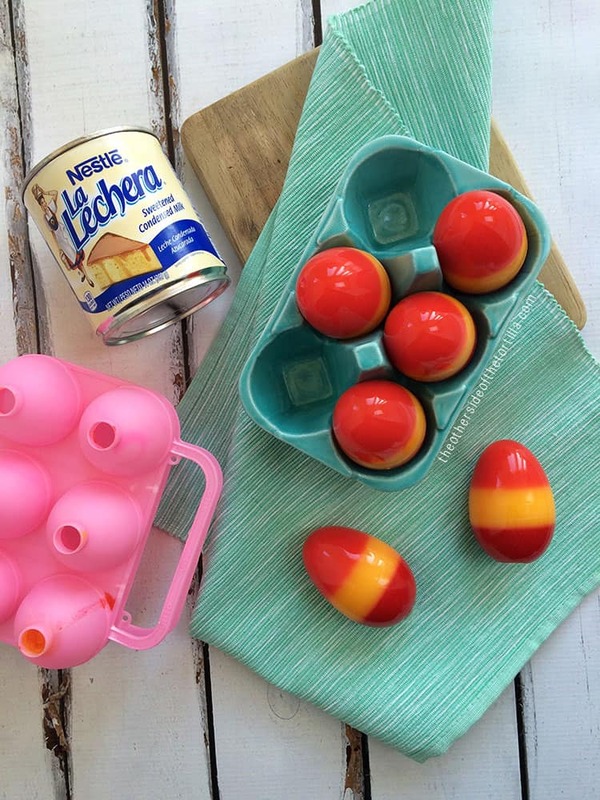 Recently, one of my aunts surprised me by gifting me the same egg-shaped gelatin mold that I used to make these treats with my mom as a kid. Apparently, my mom had loaned it to my aunt when my cousin was still little, and she’s had the gelatin mold in her cabinet ever since. I was so excited to recreate this childhood memory! The color and flavor combination you choose is up to you, but I like to use no more than three flavors so it’s not an overload and you can actually taste the flavor of each layer. In this recipe, I’ve used raspberry, strawberry and mango-flavored gelatin. In a saucepan, bring 2/3 cup water to a boil. Remove from heat and add one 3-ounce box of flavored gelatin and stir until dissolved. Allow to cool for 5 minutes. Add two tablespoons of La Lechera sweetened condensed milk and whisk into gelatin until dissolved. Lightly spray the egg-shaped mold with non-stick cooking spray and close the mold tightly. Pour the gelatin evenly among each mold and refrigerate for 15 minutes. Repeat steps 1, 2 and 4 with the second 3-ounce box of flavored gelatin. Refrigerate for 15 minutes. Repeat steps 1, 2 and 4 with the third 3-ounce box of flavored gelatin. Refrigerate for 15 minutes. Repeat steps 1, 2 and 4 with the fourth 3-ounce box of flavored gelatin. Refrigerate for at least 3 hours to fully set the gelatin. To remove from the molds, gently run warm water on one side of the mold (opposite the hole where you poured the gelatin in) for about 10-15 seconds, carefully open the mold and remove to serve. Cook time listed at three hours is the refrigeration time to allow the gelatinas to set properly before removing them from the molds. You can make this recipe several days in advance, remove from the molds and store in the refrigerator until you're ready to serve them. How sweet are those?!!! I love this idea!